On Saturday I went down to the park in the morning. The weather was looking like it was going to change to rain and I wanted to see if I could get a few more last minute Fall shots of the leaves before the winter storms rolled through and started knocking them all down. As I strolled down the path I spied this park bench that was covered in leaves. I noticed this one that was caught up on the back of the bench. I just loved the way it hung there. It had such great color compared with the drab bench it was clinging too. I framed up the shot as I liked it and fired away. 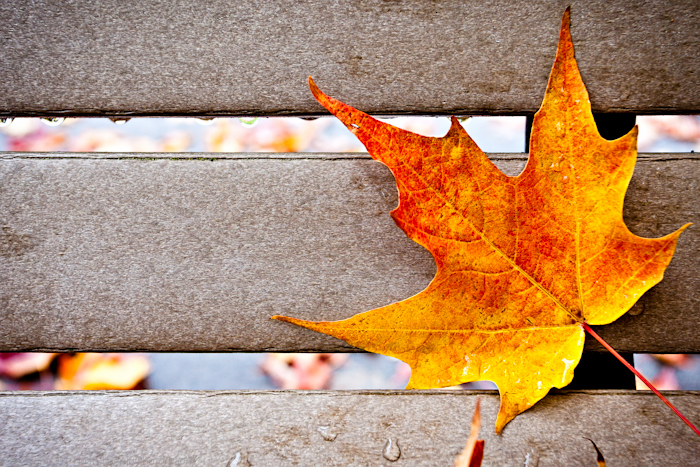 What I also like is that you can see the fallen leaves on the path behind the bench through the slats of the seat. The idea for this shot was inspired by this ebook entitled “Close to Home – Finding Great Photographs in Your Own Backyard“. The ebook is really good and is all about finding the amazing things that are close to home. How many times have you thought that you could only capture incredibly moving images if you traveled somewhere? We tend to get bored with our lcoal surroundings because they are familiar to us. But that doesn’t mean that there isn’t some incredible imagery waiting to be discovered and captured. I love the Craft & Vision ebook series. At $5 you really can’t go wrong with any of them. In fact I have all of them and have learned a lot from them. Check them out and let me know if you have any questions about them. Meanwhile get out in your own backyard and start shooting. You might be surprised what you end up with.